This book is about how people behave. Not how we think we behave, or how we’d like to behave, but how we really do. It is a story of how a failure to understand human nature helped cause one of the biggest crises in the history of capitalism. Of the extraordinary extremes we witnessed from the socalled Maters of the Universe – their greed, recklessness and irrationality. Of how that failure led to policy mistakes that magnified the crisis. And of how the crisis will happen again unless we get to grips with it. Anyone wishing to understand the nature of the global economic mess in which we still find ourselves – an understanding which is essential if we are to avoid a repetition – would do well to read this book. 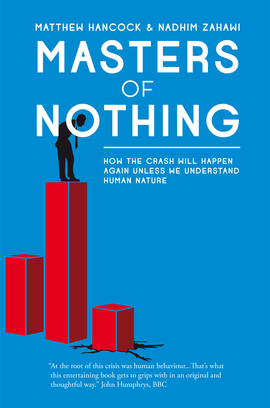 Amusing and incisive, Masters of Nothing is the best account of the crash I have read. Hancock and Zahawi make original and powerful arguments about the crash, told through gripping stories about the real behaviour of the people at the heart of it. With the anecdotal appeal of Freakonomics, this entertaining, honest and procative book is a must-read from two rising voices in British politics.